Everyone who is interested in good nutrition asks this question sooner or later that Which beef is best. This article will provide you with the relevant information to make an informed choice. The criterion used to determine what is best is that all foods which are closest to the way they are found in nature are the best. Using this criterion, let’s see how is the beef obtained from nature. It’s taken from the cows, goats etc. 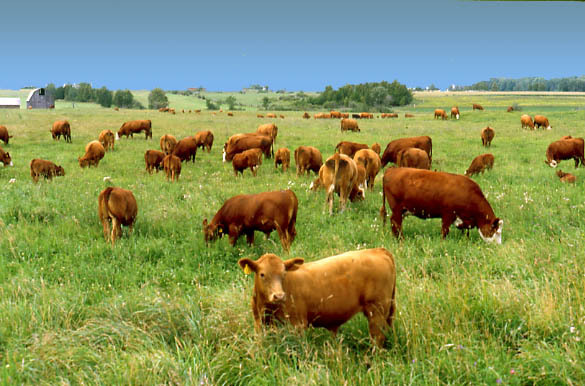 In nature, these animals graze pastures naturally and eat what they like. To the contrary, animals raised in factory farms are given diets designed to boost their productivity and lower costs. The main ingredients are genetically modified grain and soy. To further cut costs, the feed may also contain “by-product feedstuff” such as municipal garbage, stale pastry, chicken feathers, and candy. Since farms are not strictly regulated, most farms use unethical practices of raising, feeding & slaughtering animals because they are not in this to improve your health, they are in it to make money and they will use any & all means necessary to increase their profit. It’s all funded by lobbyists who will stop at nothing. Have you ever wondered why don’t you find any videos showing how animals are raised, slaughtered or processed for our consumption. All farms have strong policies to avoid this. Why, because most of their practices are so inhumane and wrong that people will stop eating beef if they see what is going on. So choose what you eat wisely, yes, grass fed beef is expensive. It’s better to eat less of good quality than more of poor quality.